2/1 Circus Fitness WS + Jo Mondy Hoop Tricks WS. Tickets on sale now. Get fit and have fun! This is an introductory session to Tink’s Circus Fitness classes. In this fast paced 90 minute workshop, you’ll experience six different conditioning sequences: warm-up movements, core strengthening, flexibility exercises, balance and turns, leg conditioning and cool-down stretching. And you can try four key circus skills including 3-ball juggling, hula hoop, balance juggling, and acrobatics. 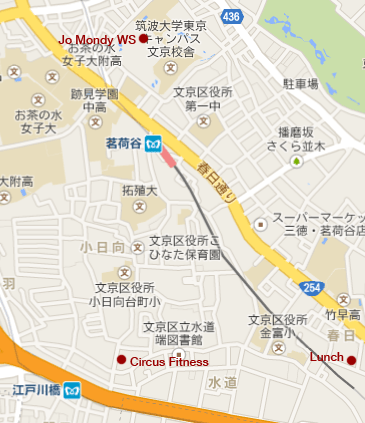 Jo Mondy, from LiveLoveHoop in Brighton, is visiting Tokyo to share an exciting hoop tricks workshop. Don’t miss this chance. This 2 hour workshop is all about learning new tricks that look impressive! In the first hour we will explore the many variations of escalators and body wraps, starting with the simple basics and working up to more complex variations. We will also look at linking these moves together into your flow. In the second hour, we will pick up a second hoop and learn an awesome new technique called the ‘butterfly hinge’ – which will allow you to flick your hoops apart in a fun and dramatic way. This workshop is for ALL LEVELS – even if you’ve never used 2 hoops before, you’ll pick the technique up quickly. Hoops provided, or bring your own favorites. Workshop leader: Jo Mondy. In between workshops, take a break and enjoy a variety of delicious vegetarian options to fuel you for the afternoon. There will be time to talk and maybe even hoop a little. Available only to participants who attend both workshops and limited to ten people in total. Buy the “Both WS + free lunch” ticket for only 4500 yen for a full day of hoop and circus fun.